In this episode, Holly Bechiri goes beyond the visual arts to learn more about the creative process in the performing arts by talking to choreographer-in-residence at Grand Rapid Ballet, Penny Saunders. Photo taken by Tom Maday of Grand Rapids Ballet choreographer-in-residence, Penny Saunders. Saunders, a has been working with Grand Rapids Ballet for five years now, for various MOVEMEDIA productions as well as her first full-length production last year, “The Happy Prince & Other Wilde Tales,” a performance that told the story of Oscar Wilde’s own life, interwoven with his stories. Grand Rapids Ballet rehearsing “MOVEMEDIA: Handmade” performance. Photography by Jade Butler. 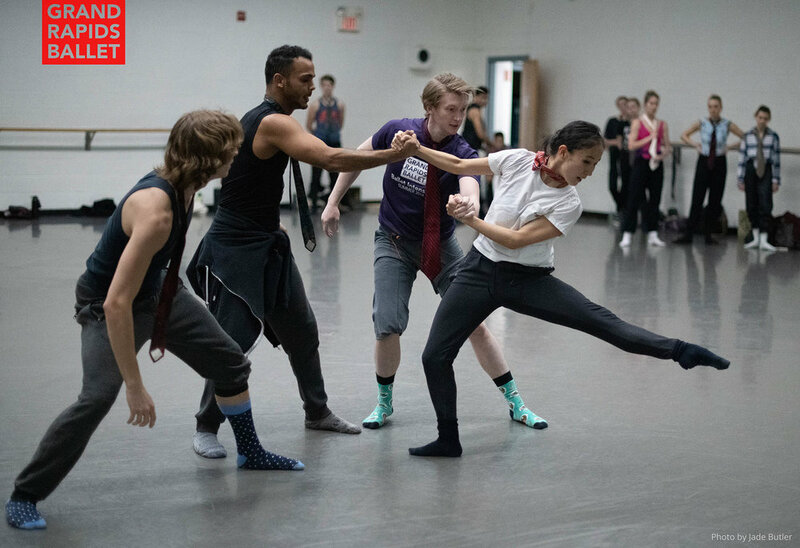 Saunders is currently working on a new piece for the Grand Rapids Ballet, called “Testimony,” a piece that was inspired by the Kavanaugh trials and has expanded since then to speak to women’s struggles to be heard and believed. The piece can be seen along with others this February 8-10 at the Grand Rapids Ballet’s “MOVEMEDIA: Handmade” performances. Tickets can be purchased here. In our conversation, we also got a chance to learn how the creative process for a choreographer can be a very collaborative process with the dancers, in comparison to a visual artist in their studio, or a theatre company receiving a fully-written play that a playwright created without interaction with the actors who will bring it to life. "The piece I'm working on for this program, [MOVEMEDIA] handmade is influenced by testimony, [and] the effort it takes a woman in particular to come forward with her story. I was particularly moved by listening to the Kavanaugh and Blasey Ford hearing. You can learn more about Saunders, who works as a freelancer around the country and in other countries, on the Grand Rapids Ballet website, or follow her on Instagram at @pennyfix.